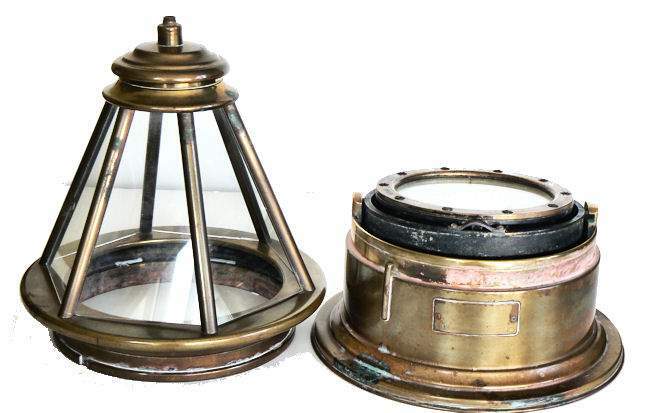 To view our current inventory of vintage skylight binnacles, click here! 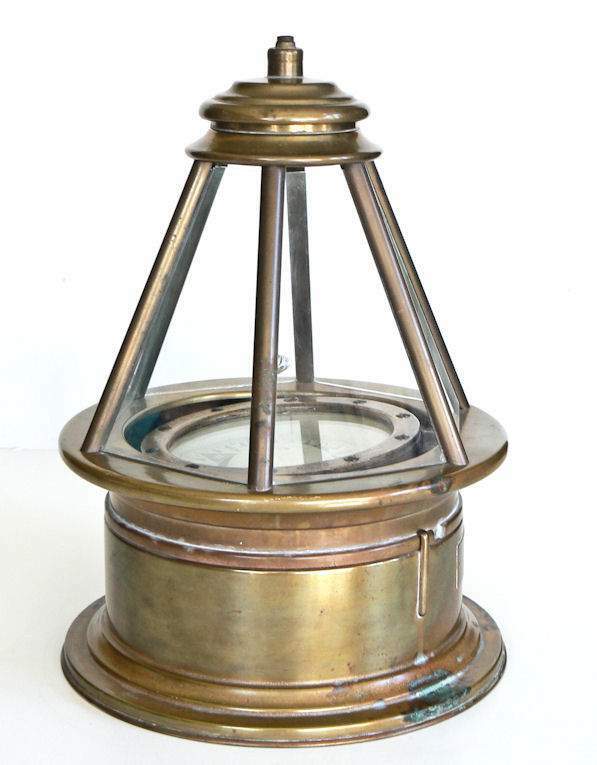 PRESENTED is a large size skylight binnacle that was made by the famous John E. Hand & Sons company of Philadelphia. It likely dates back to the 1920's. 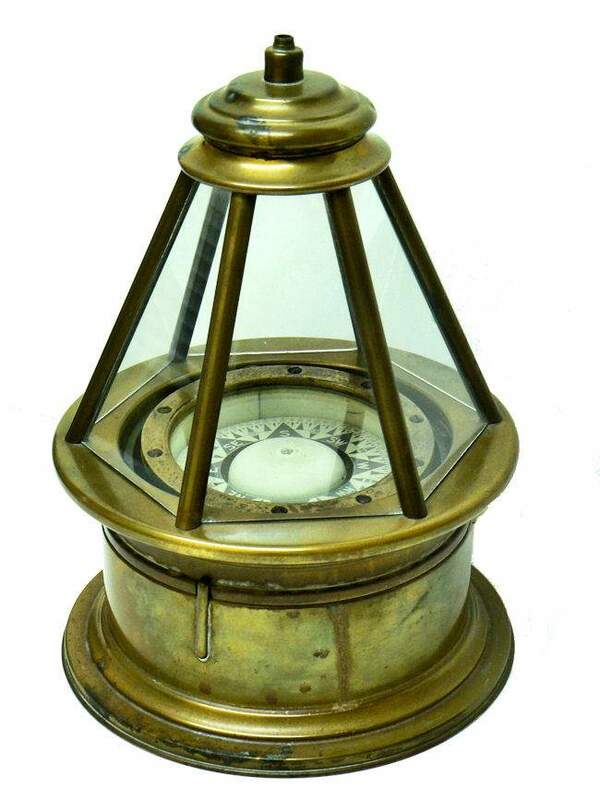 It is made of brass and has six glass panels, with a Hand 6 inch gimbaled compass, serial number 6293, housed inside. Binnacles like this were always found on the most expensive yachts and each of the major American maker's Ritchie, Danforth, Wilfrid O. White, PERKO, and John Hand had examples for sale. Unfortunately, because of their high cost the last maker of contemporary skylight binnacles, Danforth, ceased production in December, 2009. This one is is about 3 inches taller than the PERKO make which we sold last year and the same height, but 1/2 inches wider than the Danforth we sold at year end 2010. BOGART' S SANTANA : Binnacles such as these became very popular starting in the 1920's. Their popularity may have increased after one was seen aboard the motor vessel "Santana" in the movie "Key Largo" (1948) staring Humphrey Bogart and Lauren Bacall. Bogie also had one in the cockpit of his famous yawl Santana. Here it is shown covered with a chrome hood. And for those interested, I insisted on having one on our ketch Bagheera which served us well during seven years of ocean cruising. PERKO discontinued making them about 1954, and Ritchie did the same. The only source of skylight binnacles until recently was from Danforth priced at $3400.00, but they discontinued compass production in 2009. They are now very hard to find in decent condition. 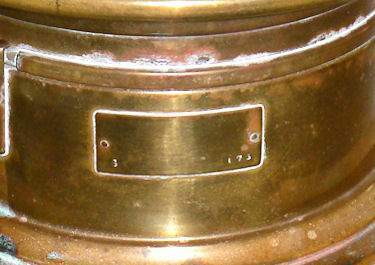 CONDITION: Some time ago this binnacle has been polished and the white residue was not removed. In some places it shows as pink. Since then, it has acquired a new patina which adds to its salty good looks. The glass appears to be a replacement and one panel has a chip along the edge. 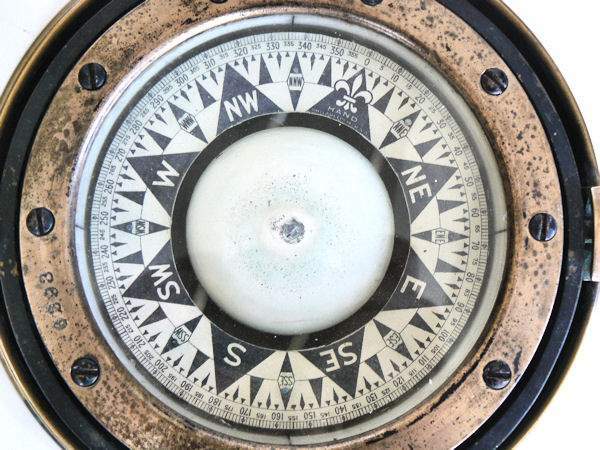 The compass is original and works properly. The fluid has been drained for shipping and unless it is going back to sea that is a good way to leave it. It is equipped with an electric connection for a compass' light. If desired, we can have the binnacle professionally polished and lacquered for a cost of $300.00 plus shipping. The plate on the front is blank. Diameter of compass card 4 3/4" Diameter of compass 6"
The company was primarily involved in commercial shipping until the late 1930s when the United States military began preparations for World War II. Though the Hand Company never completely abandoned its involvement with private industry, after World War II, military contracts continued to be their major business. Of note are the wrist compass, they developed for the Navy beginning in the 1950s, and the Mark VII Model 5 Navy Standard Binnacle. Though it moved numerous times, the Hand Company headquarters and factory remained in the Delaware Valley, occupying several buildings in Philadelphia and southern New Jersey. Maintaining its central office in Philadelphia well into the 1900s, the factory was moved to Atco, New Jersey around the turn of the twentieth century and subsequently to Haddonfield, New Jersey. It moved one last time in the 1960's to Cherry Hill, New Jersey.